Service Center for Independent Life is a non profit organization. We rely on your generosity to stay alive. Use Amazon Smile when making Amazon purchases and Amazon will donate to us on your behalf!! 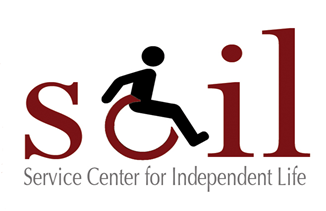 Your online purchases can make a difference for Service Center for Independent Life (SCIL) ! We are now a registered charitable organization on Amazon Smile, a part of Amazon where you can shop the same products at the same prices, but 0.5% of your purchase will be donated to an organization of your choice. Next time you buy something through Amazon just go to https://smile.amazon.com/ch/95-3536676 and make sure “Service Center for Independent Life” (our legal name) is selected as your charity of choice! You only have to select us ONCE, but EVERY TIME you want to buy something on Amazon you need to go to www.smile.amazon.com and then we will receive a donation of a portion of your purchase from Amazon! Thanks for your support! Our Assistive Technology Device Lending Library is always in need of donations. If you have any AT equipment you would like to donate, please contact us and we will make the proper arrangements. Your donation will greatly assist us in better serving our consumers.